Reading this, the first thing that will come to your mind is Let The Right One In and yes, it is a very similar one. 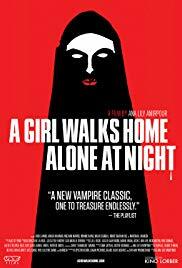 Both are slow paced, focus on the romance instead of the horror, and both feature very unusual characters (kids in Let the Right One In, loners in this one). Now the story in itself is nothing noticeable and is pretty empty actually. But the beauty of this movie lie in its very austere style. Shot in black and white, really slow and with not much talking, this one will take you out of your comfort zone. The music plays a huge part of the movie too, and adds a lot to the movie’s emotional aspect. A beautiful watch not to be missed this year.